There's a sense of freedom to be found in loading up your RV with all you need to survive and hitting the road to explore new places and commune with nature. This RV does it a little differently - as you'll notice it's completely human powered, about half the size of a normal cab-over camper, and it's completely emission free. 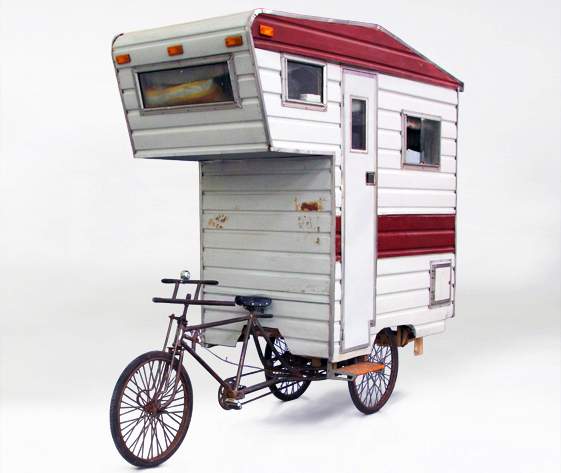 Designed by Boston-based artist Kevin Cyr, the Camper Bike is both a fully functioning RV and the subject of a number of Cyr's amazing paintings. The pedal powered camper was constructed in April 2008 and is built for one. Attached to a burly tricycle frame made to haul goods, the cab-over easily sits on the back platform. Like a turtle shell this camper goes anywhere the owner can bike it. The camper’s interior features small and efficient appliances as well as a place to sleep and storage. We’re dying to see pictures of the inside, but alas, none have been found. That might be great in South Dakota, but around here we have these things called "hills". If there is a generator that makes electricity while you pedal to your next location, and it charges batteries that run your DC appliances, that would make it complete! And a satellite dish! LOL! not pedal powered, petrol powered. the pedals are just to get the motor going. like an old "moped". i'd like to see someone pedal up a hill pulling all that weight without the assistance of a motor. I would truly like to know how i can get one of these? Curious. Is that a Main Street Pedicab frame? http://kevincyr.net/index.php?/project/camper-bike/ slide 15 has a black and white sketch as well. 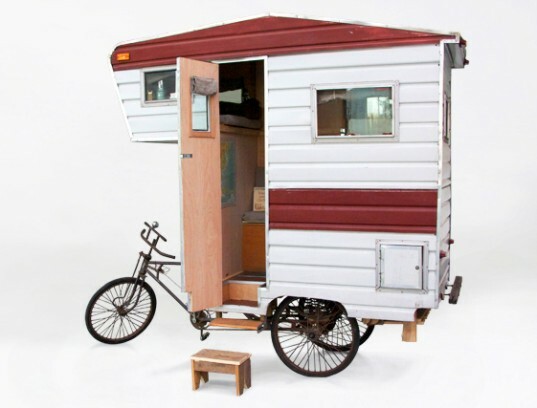 The pedal powered camper was constructed in April 2008 and is built for one. Attached to a burly tricycle frame made to haul goods, the cab-over easily sits on the back platform. Like a turtle shell this camper goes anywhere the owner can bike it. About his work, Cyr says, “In this particular series, I commemorate commercial vehicles inundated with graffiti and rust, working vehicles, and well-traveled recreational vehicles." The camper's interior features small and efficient appliances as well as a place to sleep and storage. We're dying to see pictures of the inside, but alas, none have been found. Cyr's Camper is also the subject of a number of his paintings, which feature RVs, delivery vans, ice cream trucks, beat up old trucks and motorcycles.